The Bay City River Roar was a great successes. Thank you for your prayers and words of encouragement. The Lord really blessed. My husband, Adam, was a huge blessing. He went and manned the tent on Saturday, all by himself, and he was able to had out 500 business cards, which also have Ephesians 2:8-9 on the back. So in essence, he was able to hand out 500 tracks right out side of the Alice Cooper concert (or whomever it was playing). I think that was the most exciting blessing about the entire thing! So please be praying that the Word will be working on the hearts of those that got a card and that this business can continue to be used to be a testimony of Christ. (And that goes for Adam and I as well). And thank the Lord for all that He has bless us with thus far! Here is one of the cookie designs I had for the Bay City River Roar and a cake that I made for a display (which means I covered Styrofoam cake forms). We had so much fun! Other than a sudden short downpour, the weather was great! The humidity was so very high, but there was a strong breeze coming off the water, which made it nice. One important thing that I learned between the Midland Antique Festival and the River Roar is this: for our humid Michigan summers, the only way to keep a run sugar cookie from bleeding it’s royal icing colors into each other, is to paint the cookie. At the Antique Festival I had made run sugar cookies and flooded different areas to get the desired affect. The icing color bled into each other after a few hours in the hot outdoors. 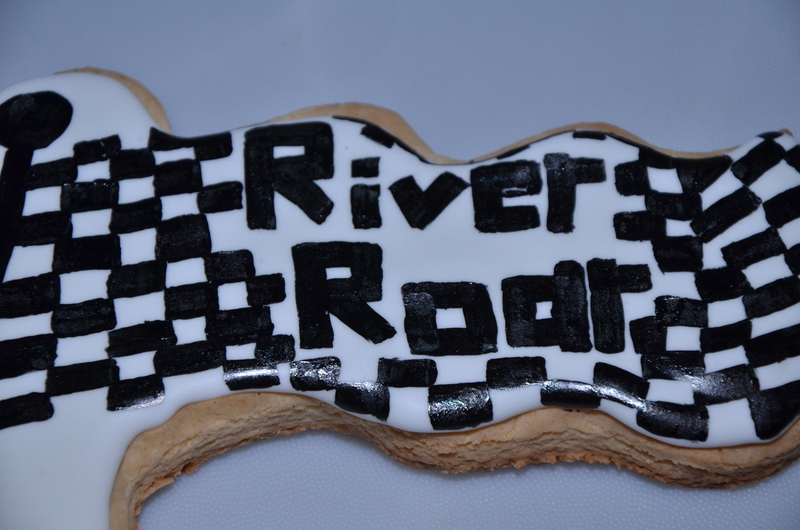 For the River Roar, I applied the base color of royal icing to the cookie and let it dry 24 hrs in advance, especially since it was black on white. Then I painted on the checkered flags and it dried very quick. I would recommend this to anyone in Michigan that will be outside for a weekend show. Please keep me in your prayers this week. Pray that all of my cakes come out fabulously as I have three very special birthday cakes to complete and I want their birthdays to be extra special!